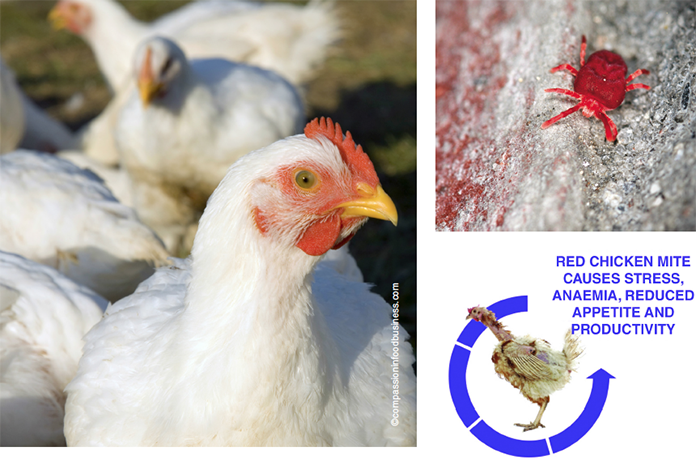 Sometimes some Mycoplasma infections cause disease in poultry and this has been extensively studied and worried about by veterinarians, poultry producers and veterinary authorities. But these are not the only losses caused by mycoplasma infections. Diseases of the respiratory tract and the synergistic effects of mycoplasma infections on other respiratory infections have been the main disease problems. But even when infections have not caused problems in a generation, the vertical trans- mission of mycoplasma to the next generation can be very problematic and costly so the infection status of a flock has been recognized as critical. Other than disease, economic costs we can clearly identify are the cost of antibiotics and vaccines, cost of monitoring flocks, and the cost of biosecurity. These are a mixture of capital costs and ongoing costs. However, inefficiencies in production may be the greatest cost. In chronically infected chickens producing eggs, the total number of eggs maybe deceased by 5 to 20 eggs per hen housed per year (layers), even with no clinical signs being observed. These costs were defined in the 1960s and 1970s. At this time, efficiency of the conversion of feed in to eggs was not considered and not measured in field trials defining production losses from mycoplasma infection. Now the efficacy of conversion of feed to eggs is a major parameter in the decision of what breed to buy. With feed being about 70% of the cost of production of eggs in the layer segment and perhaps 50% of the cost of production in the broiler breeder segment all around the world then, any increase in efficiency of production goes very fast to the bottom line. 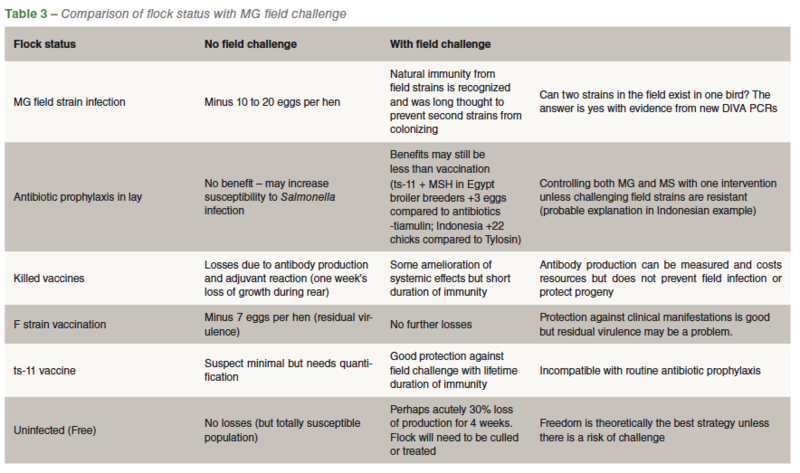 In field trials in the USA, France and Japan (summarized in Table 1) comparing MSH vaccinated flocks with unvaccinated layer flocks that were infected with MS field strains have consistently shown improvements in FCR of feed into eggs in the region of 4% less feed. Similar results have been seen in Indonesia and Egypt in breeder flocks. MG is generally more pathogenic than MS but this does not mean that the production effects of the infections are also greater from MG infection. The host parasite relationship of MS and the chicken seems to be a lot more mature than MG and the chicken, probably because it is a more ancient relationship. Indeed, the pathogenic effects of mycoplasma infections in the chicken are largely from the host inflammatory and immune response to the infection rather than that from toxins or other bacterial products elaborated by the mycoplasma. The unique feature of why mycoplasma infections are problematic is the chronic-active state that they persist in the bird in the trachea for the life of the bird. 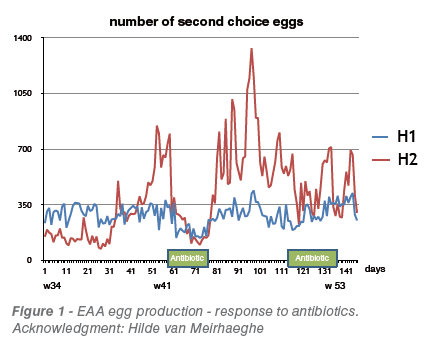 This is why four to eight weekly prophylactic administration of anti-mycoplasmal antibiotics in lay appears to be beneficial in infected birds; sometimes this makes antibiotics appear like a Vitamin to production staff; antibiotic in–eggs out. The antibiotic tips the balance in favour of the bird in the struggle with mycoplasma infection but we know from observations on flocks with EAA that the antibiotic effect does not last for more than 12 days after administration is over (see Figure 1). Two studies have suggested that MS infection is correlated with increased second quality eggs in flocks without EAA. These studies may have been confounded by the occurrence of Brachyspira spp infection at the beginning of lay. Pathogenic Brachyspira infections are associated with egg production decreases that respond to antibiotics including those targeting bacterial cell wall synthesis and diarrhoea – manifesting as collapsing manure cones under cages and caramel coloured stained egg shells – with no increase in mortality or respiratory clinical signs. Maybe there is less impact of Brachyspira at the beginning of lay when prophylactic antibiotics are given. There are other ways of controlling the impact Brachyspira infections in lay than antibiotics (water acidification). This chronic-active infection is more easily seen in MS infections. Tracheal populations persist at high levels for the life of the bird (see Figure 2) despite the immune system trying to clear the infection. MS has devoted over 10% of its genome to being able to vary its major adhesion. For a minimal organism this is commitment. MS has Fc receptors to confuse the immune response. It is rare that the ability to cause disease helps a pathogen survive unless cannibalism is a transmission method. It is usually a by-product of a feature that does help survival (for example increasing efficacy of transmission). In MG infections tracheal populations seem to decrease to very low levels during the chronic phase. MG and MS have different strategies for persistence and in some ways MS is more successful. MS seems to be able to transmit more readily between farms than MG. 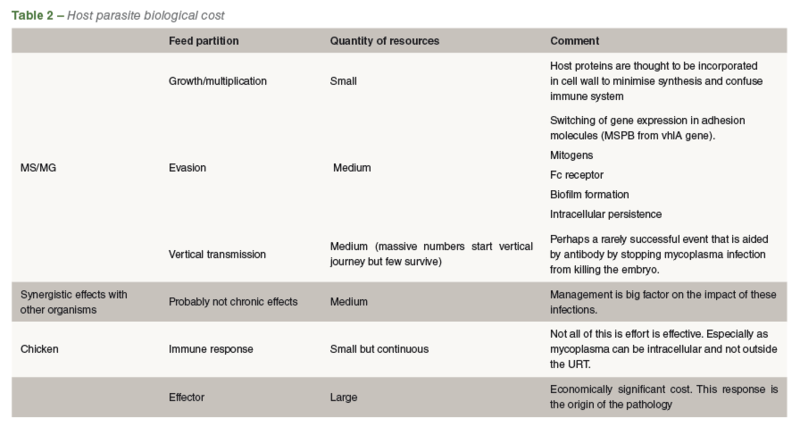 The biological cost of vaccination with live mycoplasma vaccines needs to be considered. This is hard to quantify but needs to be considered as it directly flows from the discussion above. 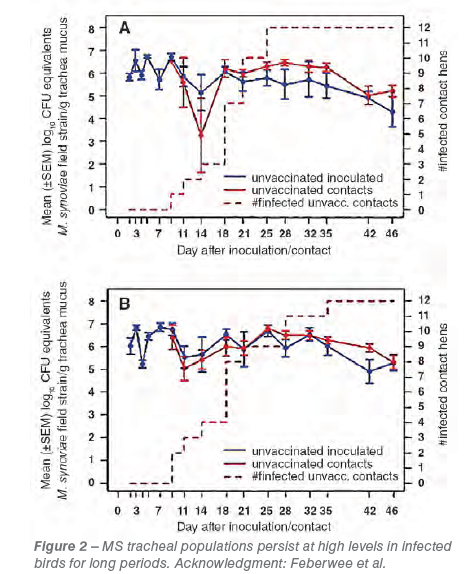 The MG vaccine F strain often has problems with residual pathogenicity and vertical transmission has also been shown to decrease production in unchallenged layers by 7 eggs per hen (Carpenter et al. 1981). Surely some of the factors described in Table 2 must also apply to a live vaccine that colonizes the bird for life. This is not saying that disease manifestations are insignificant but it is argued in this paper that just because you don’t see disease that the cost of mycoplasma infections is significant. No disease may lull one into a state of complacency. It is becoming clear that Mycoplasma infections in chickens cost more than just the disease manifestations. The subclinical costs from decreased egg production and decrease efficiency of production of eggs are significant. Not all producers can measure FCR of feed into eggs at the moment but it is clear that this is one of the most important parameters in the profitability of egg production. With feed at 70% of the cost of production of layers the saving from MS field strain control by live vaccination of 4% of feed this benefit is a 3% decrease in the cost of production. The producer has to purchase feed every week so a feed saving will reduce the cost of production every week. While nothing seems to be known about the effect of MG infection on this parameter, it is prudent to control this infection as well. It is a chance that the advantage from MG control may not be as large. Although the carriage of the vaccine, which is essential for maintenance of the immunity, will have some biological and therefore economic cost it is essential that this cost is balanced with the convenience of protection against the effects of field strain infection. In areas where the risk of challenge is high vaccination with live mycoplasma vaccines is the obvious strategy and also allows massive benefits in antibiotic stewardship in the vaccinated generation and, in the case of breeders, in the progeny as well.